It was a magical moment. We were on an impromptu barefoot hike after dinner, in the dark, with our torches off. The moon had not yet risen, and starlight faintly lit the expanse of sand around us, from the painted sky above. We were in awe, passing through an incredible landscape of seemingly infinite depth, and as we approached the dune, it became a massive wave, looming over our heads against the sky. In that wild moment it appeared that we needed to make a choice; to run forward at great risk of being capsized, or to turn and run for safety. Peak moments such as these are often amplified by the intensity of our activities leading up to that point. 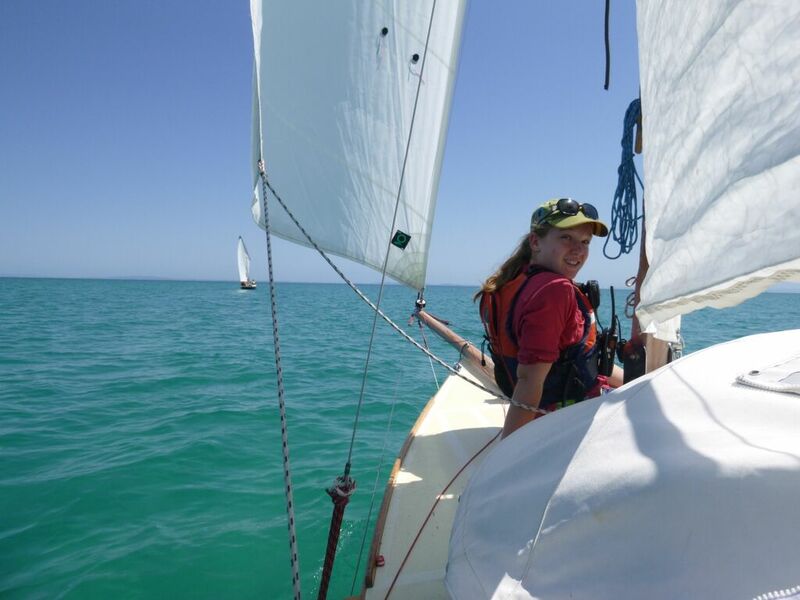 In this case it was a four day Duke of Edinburgh Award expedition to Moreton Island… four young sailors aged 14-16 (two aiming to qualify for bronze, one for silver and one practicing at gold level) along with three skippers and two adult helpers. We had been reaching under full sail across Amity Banks at high tide, to find our next campsite tucked beneath the big sand dunes at Kounugai. Fetching the distant island we sailed across many miles of clear water, clean sand and patches of seagrass passing underneath us, as dark and mysterious as sharks. Brahminy anchored on the beach at Moorgumpin (Moreton Island). Occasional stingrays and groups of massive green turtles were startled by our passing. Dolphins and dugongs surfaced in the deeper water nearby while the crew were distracted from their tasks of navigating, steering and trimming the sails. Standing watch on the foredeck was the most popular duty – until we tacked towards the shore. Bullets of wind shot across the water as we sailed into the lee of the giant sand hills, suddenly heeling the boat – requiring us to jump and sit closely together on the windward side, leaning into the wind and working to trim the sheets. There was a chance of capsize, but – despite terrifying moments of self-doubt and fear – we landed safely and secured the boats, before climbing the dunes to witness a spectacular sunset, and reflect on the day. Important personal insights and lessons stem from what happens in stressful situations. A safe and supportive learning environment with facilitators using a strengths based approach, together with encouragement and support as group norms – can help to meet the learning needs of us all. “Mistakes” and “failure” must be redefined, for it is through these cracks that the light gets in. Structured activities must be student centred, challenging, flexible and full of hands on experiences, relationships, metaphors and interconnectivity. Nature Play is all of those things as well. It supports us in our work; especially when we position ourselves so that wild nature surrounds and permeates us. Unstructured time allows us the freedom to re-create, recover and have a lot more fun in a program. It also allows space for contemplation and reflection, to synthesise and create meaning. In doing all of this, I believe we can build resilience from our experiences. Resilience is widely defined as “the capacity to cope, learn and thrive in the face of change, challenge and adversity” (Cahill et al 2015). Resilience includes the various skills that allow us to weather the storm, the inner strength to carry on despite ongoing challenges; the drive and inspiration to bounce back again! These skills are certainly learned through our structured activities; but also develop through spontaneous group games, through shared stories, explorations of country, relationships and ideas, through solo time, observation, reflection and discussion; retelling our stories of triumph and hard times around the fire. 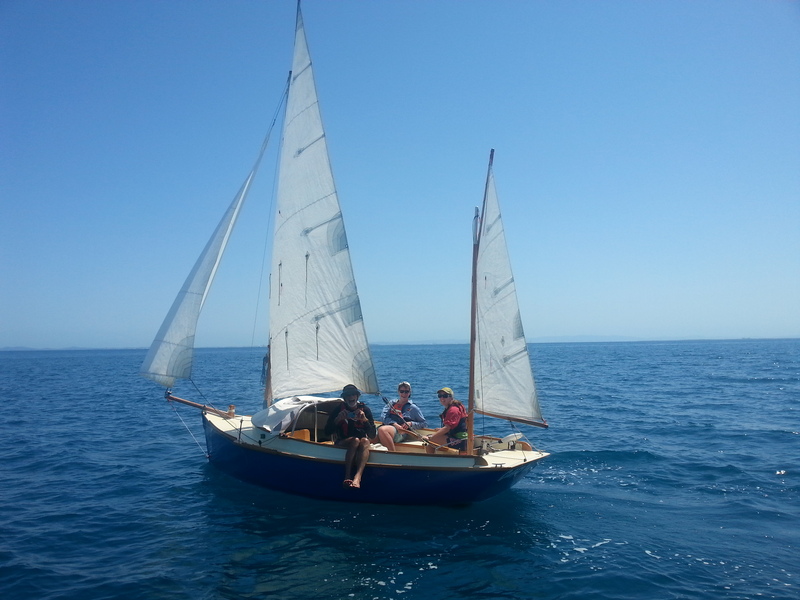 The Sea School focuses learning through the social environment of small open sailing boats and beach camping. The physical, emotional and psychological highs and lows of sail training provide many growth opportunities, along with communal living and facilitated debriefing. The synergy between structured activity and unstructured play on adventure programs can be enhanced by good sequencing and flexibility – maintaining a balance – and clearly this is more possible on extended expeditions. Expeditionary learning (adventure based learning while on expedition) creates a natural cycle during the journey, like a spiral of activity, rest/reflection and planning/replanning – an action learning project. We must encourage times and places where our staff and participants are spending unstructured time together – playing games outside, exploring the natural world, free range discussions around the fire; or spending time apart for solo experiences, rest or reflection. These relationships are critical to deep learning, and can lead to personal insights, self-awareness, esteem and empowerment; and that is what we need to enact changes in our lives. Let’s continue creating a healthy, diverse learning environment for our children. We need a capable, response-able and resilient community who will be able to accept the massive challenges that will face them in the future. Caitlyn skippers the passage home to qualify for her Bronze award. Kelsey can be seen kicking back – watching and planning for his qualifying Gold expedition – it’s up to you now! Alexina was testing the sleeping accommodation, while Bob is in his more serious role as chief examiner. Congratulations also to Hannah for completing Bronze, and Tahlia qualifying with Silver. Thanks also to Bev and Rob for your excellent support and guidance out there! Lans, R et al (2014). Resilience – Core Learning. Maroon Outdoor Education Centre: Education Queensland. Full moon sailing, happy Easter!